In a pan with 3 liters of boiling water seasoned with salt, add the chicken, gizzard and heart. Cover and cook for 35 minutes or until the chicken is cooked. Once it's cooked, remove to a dish and let it cool. In the broth from cooking the chicken, add the carrot and cook for 5 minutes. After 5 minutes, add the pasta of choice, stir and cook for another 10 minutes. Meanwhile cut the gizzard and heart into small pieces. Remove the chicken skin and bones and shred the meat using your hands. Once the pasta is cooked, add the shredded meat, gizzard and heart. Stir and remove from the heat before it starts to boil so you don't over cook the pasta. In a different pot with boiling water seasonsed with salt, add the vinegar and stir the water in a circular motion with a spoon. Crack and add the eggs one by one and let them cook on medium heat for 3 minutes. After the 3 minutes, remove the eggs with a slotted spoon and let it drain well. Add the soup to the plates and divide the eggs by the plates over half a slice of the Alentejo bread. 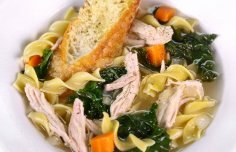 How to make Portuguese style turkey and kale soup with Christmas leftovers. 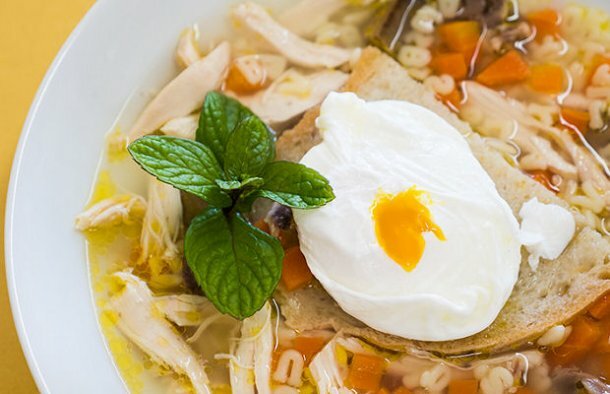 This Portuguese soup is a bowl of healthy eating. 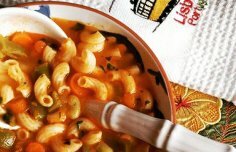 Just serve with some crusty bread and dinner is served! This octopus stew with chouriço is loaded with rich flavors.